Running your own mail delivery servers is difficult. It's easy to get it wrong and end up on every blacklist available. Even if you aren't on blacklists, there are still plenty of ways to end up sending your emails to the bit bucket instead of your customers. Sendgrid's promise is to run your mail servers for you and do it right. But which pricing plan should you choose? Sendgrid have pricing plans available to suit everyone from fresh startups with more co-founders than customers to multinationals with more customers than Australia has sheep. While these pricing plans seem quite simple, getting the best value for money can be a bit tricky. When exactly is it worth upgrading from Silver to Gold? The Silver plan comes with 100,000 credits but if you thought the right time to upgrade was as soon as you are sending more than 100,000 emails per month you would be wrong. The Silver plan is still cheaper than the Gold plan when you are sending 200,000 emails per month. When should you upgrade from Gold to Platinum? Not at 300,000 and probably not even 700,000. There is so little difference between these two plans above 700,000 emails per month that even when you are sending a million emails per month you are only paying $15 extra on the Gold plan but if you have a quiet month and dip below 600,000 you are $50 worse off on the Platinum plan. 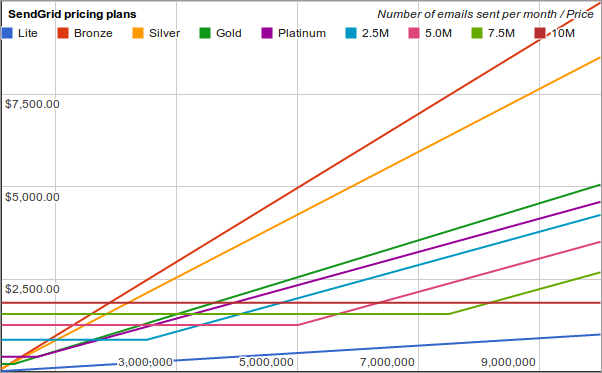 It's safer on the Gold plan if your email volume is at all variable. To use the charts, simply find the number of emails you expect to send each month on the X-axis and move upwards until you find the lowest price line. That's the cheapest plan for your chosen number of emails. For some companies it's difficult to predict how many emails you will send each month. If you know that your sending volume could swing up or down by 30% each month, find the upper and lower volumes of emails you could send and choose the line that has the lowest average in between those two points. Both of these charts start at 100,000 emails per month. Below that the plans differ in both features and price so the chart would not be giving you the full picture. The Lite plan shown as a blue line at the bottom also differs quite significantly in its features. There's a reason it is so much cheaper. It compares quite closely to Amazon's SES offering. Amazon only have one plan but they charge you separately for bandwidth and they don't offer all the same features as Sendgrid. 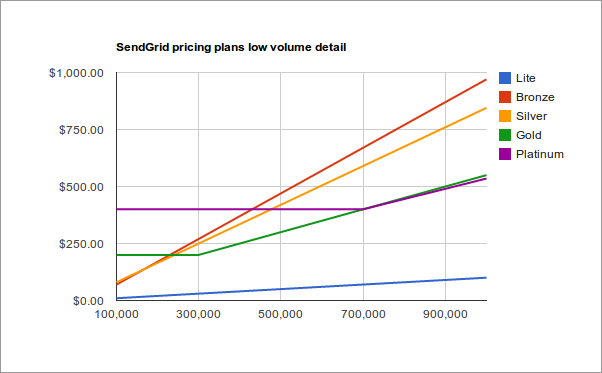 Sendgrid also have higher volume plans. On their pricing plans page it simply says to contact them if you plan on sending more than 1.7 million emails per month. When I did contact their sales department, I got a response with the plans labeled 2.5M, 5.0M, 7.5M and 10M on the first chart. No one wants to pay too much for their email service. With these charts, you can optimise your Sendgrid plan so that you don't waste any money. 0 comments - Be the first ! I have recently made some improvements to the Middle Name Guesser (one of which was to make it actually work again) and I'd like to take this opportunity to invite you to have it guess your middle name... or your friend's middle name, or your favourite celebrity's middle name. I expect to see the ratio of correct to incorrect guesses remain relatively unstable until the number of new, unique middle names, first names and last names (the red, blue and purple line) starts flattening out. After that the ratio should only improve as the relationships between the known first and last names and middle names are strengthened. 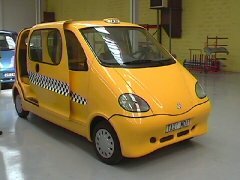 There's an air powered car that has been causing some hype recently (which, I suppose, is considered "fuel" for this new car. Heh.) and, while it's not all that new, some people are cautiously (and not so cautiously) predicting that "2008 is the year of the air powered car". As a born skeptic, I felt the urge to play devil's advocate. My first thought was that the compressed air has to come from somewhere and that the process of compressing the air would require energy from more traditional sources. This technology isn't a new way of generating or extracting energy. Much like the talk of Hydrogen-powered cars, this is a new method of storing energy in cars that has been generated somewhere else. Most of these sorts of schemes don't help reduce pollution, they just offset it somewhere else. While this is good for people who live in cities, it's not any better for the planet as a whole. But there may be more to this plan than just offsetting the pollution. 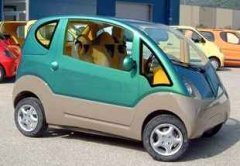 A compressed-air powered car has a few advantages over a Hydrogen powered car: Hydrogen has to be converted from it's pure state into a form with a lower energy content or higher entropy. This is usually achieved by combining it with Oxygen, which is readily found in the atmosphere. The process of combustion usually takes place inside a modified conventional engine or in a Hydrogen based fuel cell, however, both of these methods generate lots of wasted energy. The power extracted from the Hydrogen comes from the expansion of the gases as they combine. The sound and heat energy that is produced at the same time is dissipated into the environment and is wasted. A compressed-air powered car, on the other hand, can extract the same gaseous expansion based energy as combustion based cars without the loss of the heat and sound-based energy. There has been some discussion (although the results I found were inconclusive) about whether the process of compressing the air was inefficient enough to offset the gains made with the more efficient power stations and in-car decompression process. The end result of reducing waste energy is that not only would the car cause less noise pollution, but the energy used to actually drive the car could be a greater percentage of the total energy available. Less waste is a good thing. There are, however, a few elements of the article that caused me some concern. The talk of the compressed air driving the pistons which in turn compress the air makes little sense. This is akin to using an electric motor to drive a generator which powers the electric motor. If it worked, it would violate the law of conservation of energy. I suspect (hope) that an over-enthusiastic reporter snuck this into the article rather than quoting directly from a scientist. The article also makes no mention of the range of the car apart from stating that there is a long-range version that would be fitted with a conventional engine. This suggests to me that this new car would suffer from the same drawbacks that electric cars suffer from: a range so small that the car is limited to the inner-city commute from home to work. After a quick Google and a visit to WikiPedia, it appears that other sites claim the range would be somewhere between 100Km - 200Km. That's great for those who only need that but I won't be swapping the long-range fuel tank in my Pajero for one of these until it comes closer to the same range. Earlier articles regarding the same technology suggest even lower ranges so with the technology getting better and better, hopefully the air car will achieve that goal eventually. Filling me with confidence again, the rest of the article shows that Negre (The motivation behind the idea) truly understands the problem of wasted energy. Firstly, the direct quote: "The lighter the vehicle, the less it consumes and the less its pollutes and the cheaper it is; it's simple," is very similar to one of the major principles behind low-energy building design. So often, when you design something inefficiently, you find that you need to waste more energy to fix problems with the design. Cars have added weight to deal with the wasted sound and heat energy which, in turn, requires more energy to carry around. Fridges emit all their heat at the back, which often gets trapped and heats the inside of the fridge back up. Fridges have to use extra energy just to remain below room temperature because the air around the fridge is above room temperature. The less wasted energy a car has, the less weight it needs to carry around to deal with the side-effects of the wasted energy. The less weight it has to carry around, the more you can do with the energy you have. In fact, the expansion of a compressed gas will actually draw in heat - the same way a fridge works - meaning the air can then be used for cooling the interior of the car. An air-conditioner and a radiator are two fewer pieces of machinery this car has to carry around thanks to it's more efficient design. Negre also has plans to use small factories in the same regions where the car is to be sold. This will probably cost slightly more - large scale factories have the advantage of being cheap on a per-car basis - but it will cost the environment less. He stated that the parts would not be shipped to the factory to be assembled but would rather be sourced locally - saving again on the environmental costs of shipping. It's possible, with the advances in technology we have made, that the whole process may just even turn out cheaper in dollars than shipping the cars half-way around the world. Wasted energy and wasted effort are wasted dollars. If Negre understands this, and I think he does, then this venture should turn a profit for both his bank balance and the environment. Ahhh xkcd, you've done it again. There's not enough security humour in this world. I want to name my cat Tiddles"><script>alert('Foo! ');</script> now, just so that I can put that in as the answer to my secret question on Facebook. I just remembered that xkcd always put a title tag on every image that contains another little joke. I've replicated the title-tag joke for this comic here as well. If you're using Firefox, you can hover over the image to read it.